Earlier we looked at an abstract alchemical emblem. Here is an example of a mixed abstract and emblematic one. 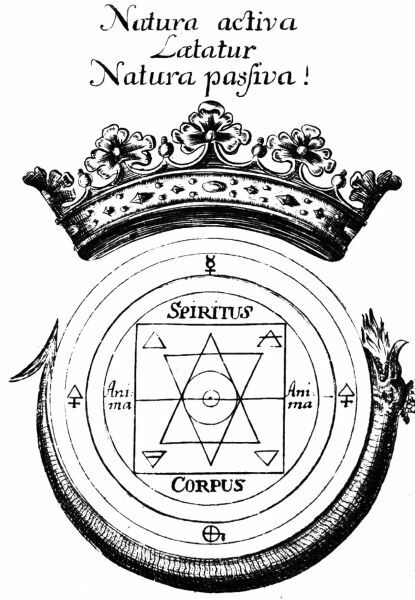 This is from an 18th century work with a Rosicrucian connection by J.G. Toeltius Coelum reseratum chymicum oder philosophischer Tractat oder Philosophischer Tractat worinne nicht allein die Materien und Handgriffe, Frankfurt 1737. For the most part it is quite simple to analyse except for one frustrating element. Here we see a crowned snake breathing flames coiled beneath a circle containing three inscribed concentric circles, at the centre of which is a square with the interlaced triangles of the solomon's seal surrounded with the four elements. Above the square is 'spirit' linked to the symbol of Mercury, below is 'corpus' associated possibly with salt, while to the right and left is 'soul' connected to sulphur. In the space above is a crown with the text "Natura activa laetatur Nature passiva!" (Active Nature rejoices in passive Nature). The frustrating bit is that the symbol at the bottom is not the usual one for salt. Instead it looks more like that for crocus metallorum or crocus antimonii. This was also known as red antimony or Kermes mineral, which is now seen as an oxysulphide of antimony( Sb2S2O), obtained by calcining antimony metal in a stream of air. You can check my website section on graphic signs and see if you can find a better candidate. Whether this symbol was intended as Salt or Crocus metallorum is not easy to identify. It would probably require reading much of the 360 page German text, which sadly has no index in which to look up 'crocus metallorum'. Some aspects of alchemy we just have accept as ambiguous and to pass over in silence.